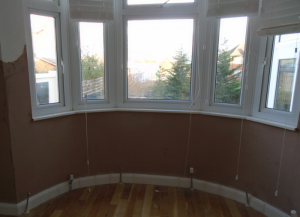 Following a problem with dampness and fungal growth Kenwood, were called to a semi-detached home in South East London. Kenwoods diagnosed a problem with rising damp affecting various walls within the reception room and kitchen. Treatment for this required the injection of a new chemical damp proof course and re-plastering. Additionally treatment was carried out at the front elevation of the ground and first floors to treat and outbreak of Dry Rot. Dry Rot occurs when timber is in prolonged contact with damp brickwork. Treatment for this outbreak required the removal of wall plaster and flooring timbers. The timbers were replaced using pre-treated ones which we isolate from the brickwork to prevent future outbreaks. The brickwork is irrigated which involves the injection and spray of a fungicidal fluid to the affected area and surrounds.